A total of 550 students from the Teachers Training Collegues of Benguela, Bie, Kwanza Sul, Kunene, Huambo and Luanda in Angola, are participating in a trip to Namibia, Zambia, Botswana and Mozambique to learn first hand about reality of rural communities in these countries. With this trip, four months, ADPP-Angola, Humana's local partner in the country, intends that future teachers learn new experiences on education and society in general in other countries. For most of them this extraordinary experience is the first time they leave the country, and the best way to know reality and a great opportunity to transmit power and then as teachers. 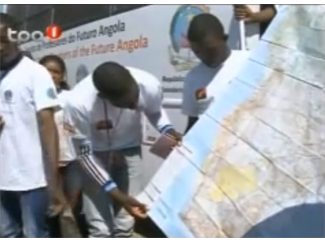 The Ministry of Education has very highly Angola trip, considering it as an innovative element in the training of teachers, which will help improve the country's educational system. Humana driven training aims to provide future teachers with the skills and knowledge to lead the progress of their communities. Also participating in other activities beyond academia. This action is part of the education program for schools, based on the combination of theory and practice, teamwork, initiative in learning beyond the academic and the student himself is the center of their own education. This same initiative has been promoted in several schools in Mozambique by ADPP-Mozambique, while ADPP-Guinea Bissau is also preparing a similar trip, always within the training curriculum for new teachers. Humana Fundación Pueblo para Pueblo supports two of the EPF promoted by ADPP in Angola. These are located in Huambo and Luanda.